The homelessness crisis in Ireland may deteriorate further as so-called vulture funds wait in the wings for rising house prices to peak before repossessing homes and selling, an expert has warned, writes Colin Gannon. The Irish government’s selling of land assets at discounted rates to private-equity firms, ‘vulture’ funds, through state agencies and banks it owns, is also suffocating Ireland’s housing supply. These investment firms entered the Irish financial system en masse in recent years as the Irish government had to rebuild the country’s banks after the 2008 financial crisis. They did so by offloading “bad assets” to promote healthier balance sheets. Since 2014, the banks have been selling those assets, mostly non-performing mortgages. UK-owned Ulster Bank recently sold a portfolio of 5,200 mortgages to vulture fund Cerberus for pennies in the euro. If loans or mortgages are repaid, the firms profit on the difference but they can repossess the property and sell it for a value much greater than what was paid for the original loan. Dr. Michael Byrne, an assistant professor in social policy in University College Dublin, said that over 50,000 mortgages are now owned by vulture funds. House prices are on an up-ward curve, which may lead to a spate of house repossessions in the future as vulture funds attempt to capitalise on distressed loans and high property prices, he said. According to The Economist, house prices in Dublin are 25 per cent over-valued against income. Prices nationally are now up 79.6 per cent above their 2012 lows, with Dublin prices al- most doubling, according to official figures. “Vulture funds might be waiting for the property market to hit its peak before they start repossessing,” Byrne said, adding that when it does peak, they “may move really quickly to repossess as much as possible and sell. 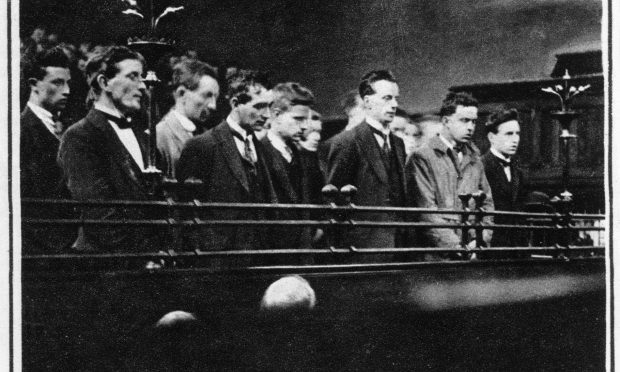 He also says that, although there is no clear evidence that vulture funds – which are not subject to the same regulatory oversight as banks – are directly exacerbating homelessness figures, “it is likely, in my view, that vulture funds would be more aggressive with homeowners and therefore we’ll see more evictions and homelessness”. Troubled buy-to-let mort- gages, he said, are probably a more immediate cause of homelessness. Focus Ireland, a homelessness charity in Ireland, says the leading direct cause of homelessness is evictions from the private rental market. The main issue, it says, is properties being repossessed and sold. Irish Central Bank data shows that in the first quarter of 2018, 22,545 buy-to-let mortgages were in arrears, 19 per cent of the total. During this period, Byrne said, 314 such properties had vulture fund receivers appointed to them – more than three every single day. Vulture funds have also led directly to a shortage in land supply, something which is exacerbating the housing crisis in Ireland, particularly in Dublin, as such assets were mostly linked to land and property. “There was no consideration given to the potential impact this might have on the housing system in Ireland. 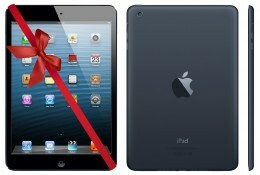 But it has had some impact, most of which was entirely predictable,” he said. The National Asset Management Agency (NAMA), a body created by the Irish government in late 2009 in response to the financial crisis, held much development land, and, Byrne said, sold at least 90 per cent of these assets to US-based vulture funds. 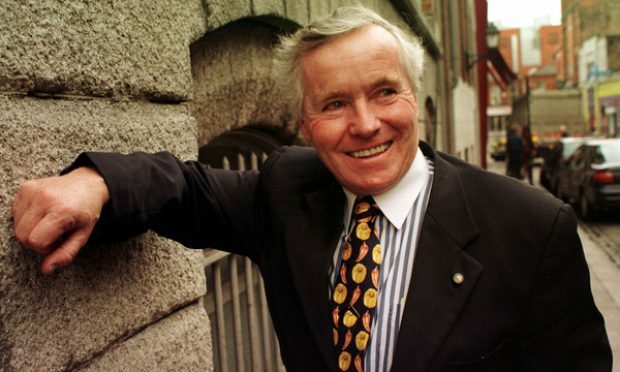 Since the Irish government is the largest shareholder in Irish banks AIB and Permanent TSB, Byrne said, they could have had an influence in strategies in selling debts to vulture funds, with the “potential to limit homelessness”. Just this month two Irish farmers led protests in Co. Meath when they learned that a vulture fund had tried to force their family to sell land to settle debts. Gerry and Michael McCann learned that the 38-acre farm for which they paid over €1m in 2008 had been listed for auction on the BidX1 property site without their knowledge. The land is due to be sold by the Promontoria fund in an online auction in the coming weeks. After Ulster Bank’s most recent knockdown sale of €1.4 billion of mortgages to a vulture fund, David Hall of The Irish Mortgage Holders Organisation, said the vulture funds are punishing individuals who had already been in talks with their banks, often to restructure mortgages that are for much more than their properties are currently worth, negative equity. 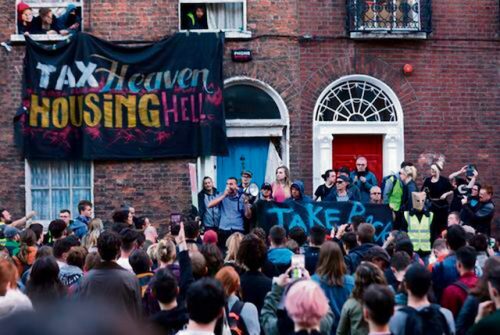 Dissatisfaction about a lack of state intervention in the housing sector is also growing with increasing protest action in Dublin. 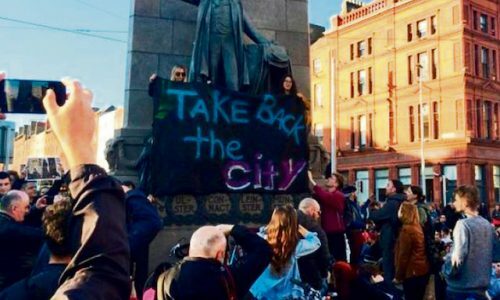 Take Back the City, a coalition of housing activists, is occupying various vacant properties around Dublin, prompting scenes of balaclava-wearing private security and masked Gardaí retaking possession from protesters. Six arrests were made on public order offences as hundreds protested the Garda action. 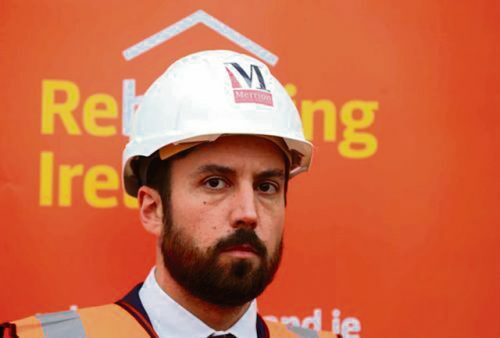 Last week, Taoiseach Leo Varadkar and his Housing Minister Eoghan Murphy (above) announced the formation of the Land Development Agency (LDA) and said that over the next 20 years, the agency will build 150,000 new homes in a €1.25bn investment. Mr Varadkar compared it to the creation of the ESB, Aer Lingus and IDA. 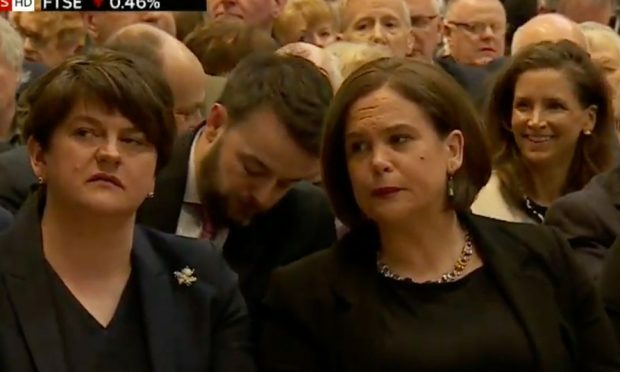 His government said that 10 per cent of those houses built will be social housing, and another 30 per cent will be “affordable” homes. 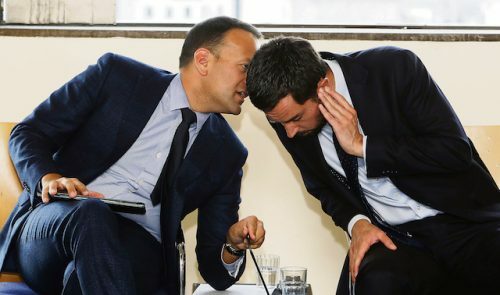 Mr Murphy came in for some criticism and ridicule – from predictable quarters – for pointing out that “affordable” LDA homes in places like Dublin, Cork and Galway would still cost €320,000 at current market prices.